Home Politics Venezuela is in a recession. Again. Venezuela is in a recession. Again. 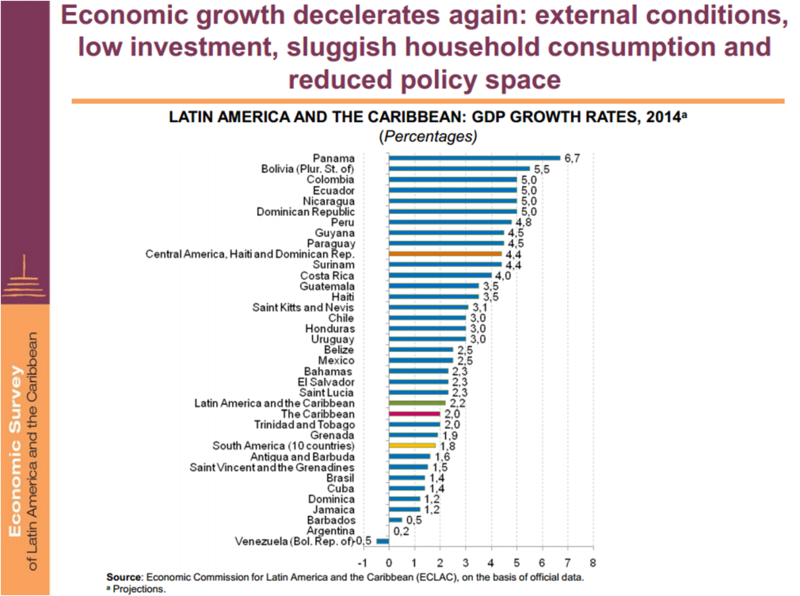 The Economic Commission for Latin America (CEPAL for its acronym in Spanish) published its Economic Survey of Latin America and the Caribbean 2014. After downloading the report, the first thing we looked for were GDP growth estimates. It’s sad, but not surprising, that Venezuela is the only country in the region that CEPAL expects to have a negative growth rate in 2014: -0.5%. This estimate matches the one from the International Monetary Fund (IMF) database (last updated on April 8th, 2014). We must agree. Those “figures” have us all concerned. The last of the recorded scarcity estimates reached 30%. When it comes to the scarcity index, we now depend on these types of leaks, because the Central Government decided not to publish it anymore. In the words of Merentes: “we do not want the index to turn into a political index that favor some and harms others”. Even though we are still waiting for the official inflation numbers for June 2014, some sources claim it reached 5.5%, for a whopping 62.1% in one year. Venezuela’s 56.14% inflation rate last year was the highest in the world, and by the looks of it, Venezuela will win the golden medal once more: IMF estimates (last updated on April 8th, 2014) suggest Venezuela’s inflation will reach 75% by the end of 2014, followed far behind by the Islamic Republic of Iran with 24% and Sudan with 18.1%. And this is even before the rise in the price of gas. And of course, we can’t forget about the ever growing monetary base. According to CEPAL: “in the economies of South America (excluding the Bolivarian Republic of Venezuela) the monetary base grew far more slowly in the first quarter of 2014 than at year-end 2013 and the end of the first quarter of 2013 (…) In the Bolivarian Republic of Venezuela, the first few months of 2014 saw further marked expansion of the monetary base; by the end of the first quarter it had grown at an annualized rate (89.9%) that far outstripped the one recorded at the end of 2013 (65.7%). Substantial injections in the form of central bank loans to public enterprises, in particular Petróleos de Venezuela, S.A. (PDVSA), are the main reason for the sharply higher monetary base growth rate in 2013 and to date in 2014”. And we can’t let go of this money-quote from Venezuela’s CEPAL report: “In 2014 the central government is expected to continue to run a fiscal deficit and to finance State-owned enterprises with loans from the central bank, given the expectation of an economic slowdown and a drop-off in oil revenues. Although the monetary adjustments are expected to yield some additional income in bolívares, these increases will be partially offset by an overall decline in oil revenues, since an increasing proportion of oil exports will be used to repay debts to China and to finance imports of food and other goods from countries that are beneficiaries under the PetroCaribe programme. A greater proportion of the deficit will therefore be debt-financed“. The -0.5% rate seems kind of… well… not realistic enough, just as all members of the Caracas Chronicles family agree on. Some sources linked to the Venezuelan Central Bank (BCV for its acronym in Spanish) say that Venezuela’s economy contracted 5.5% in the first quarter of 2014, while other BCV sources talk about a contraction of 4.5%. Econanalítica, a private consulting firm, estimated a contraction of 3% for the first quater of 2014. In the midst of an oil boom we would expect a higher –or at least positive- growth rate. We’ll just have to keep hoping.